With Edwards Syndrome there is chromosomal abnormality with an extra copy of chromosome 18 hence it is also called trisomy 18. 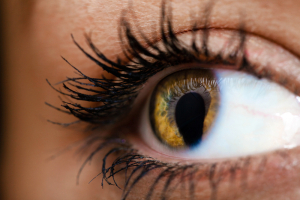 It occurs with a frequency of 1 in 6500 births. This is a syndrome with many serious malformations that interfere with a normal life expectancy. About half of the pregnancies die spontaneously due to severe malformations incompatible with life. Of the remainder half will die within the first 2 months, so that only 5% to 10% will survive the first year. However, the multitude of malformations severely limits their long-term survival. The child is usually born with a low birth weight, has a small mouth (microstomia) and a small jaw (micrognathia). This tends to interfere with the normal feeding process. There is a small head (microcephalus) with an oversized back of the head (prominent occiput), low set malformed ears, flexion deformities of fingers and rocker-bottom feet. 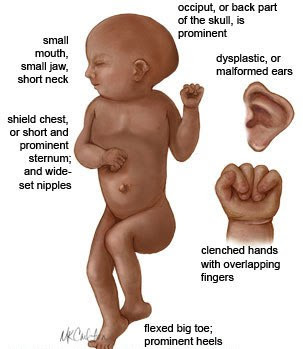 Here is an image with the described malformations. In addition these children have severe mental problems due to a brain deformity with additional folds on the brain surface (extra gyri). Congenital kidney and heart abnormalities may be the life limiting abnormalities in addition to the mental retardation. The most devastating fact is that 99% of children born with Edward syndrome have congenital heart disease, ventricular septal defect, patent ductus arteriosus or pulmonary stenosis. 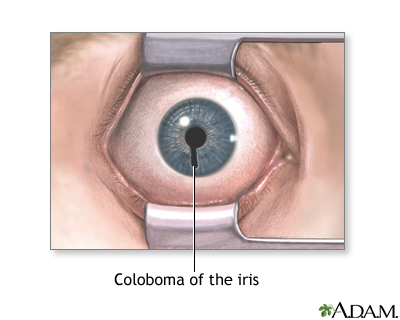 Another typical malformation is a defect of the iris of the eye, called coloboma. As this is a genetic syndrome, there is no treatment available at this time. These individuals will need to live in a supportive environment and often end up in a specialized home that is equipped to deal with these patients.